Go Philadelphia Flyers!! 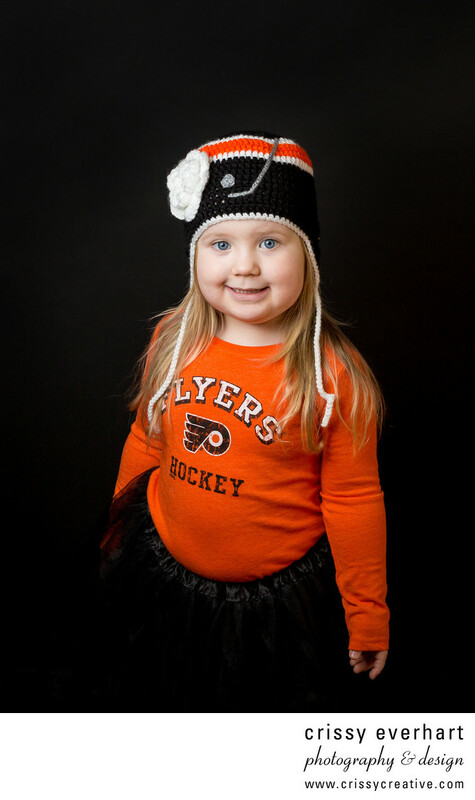 This little hockey fan sports an orange Philadelphia Flyers shirt, black tutu, and orange, black, and white knit hat with a hockey stick and ball and a flower sewn on it. Her blue eyes stand out amongst the orange and black, and her blonde hair lays on her shoulders underneath her hat strings. Photographed with one flash, off camera in a soft box, this low key image (on a black background) has a lot of contrast and color and is a perfect gift for any hockey loving parent in the Philly area!